If you’ve ever been to downtown Lebanon, you can hardly have missed AVA Gallery and Arts Center, a centerpiece of the community’s creative economy for decades. 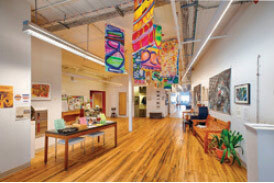 Located just off Colburn Park on Bank Street, the center offers artist studios, galleries, and numerous events and programs for youth and adults interested in a wide variety of visual arts. There’s always something interesting happening at AVA. 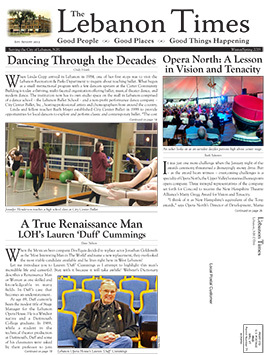 Here’s a selection of some of the latest news from the center. To learn more about upcoming classes and events, visit avagallery.org – or better yet, drop in and see what’s going on for yourself! An exhibition at AVA Gallery this month features works by Upper Valley high school students who have been nominated for participation by their art teachers. The exhibition includes works from 18 participating high schools, including Lebanon High School and Ledyard Charter School. The exhibition, which is free and open to the public, will be on display from February 13 to March 6, with an award ceremony taking place during the opening reception on Friday, February 13, from 5 to 7 p.m. This year’s awards will be chosen by Trevor Fairbrother, an independent writer and curator from Hanover, N.H. 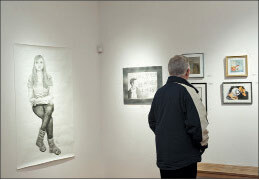 The Best of the Upper Valley High School Exhibition is one of many art programs AVA offers for the benefit of youth in our region. AVA’s commitment to providing youth with meaningful engagement in the arts also includes internship opportunities that promote professional development; scholarships towards classes and workshops; access to AVA’s Digital Arts Media Lab; and afterschool and summer camp programs. The Mudroom, modeled after NPR’s The Moth Radio Hour, continues to draw large crowds to AVA for lively evenings with talented storytellers and mesmerized audiences. AVA is currently looking for storytellers on the theme “Paws and Claws” for the next Mudroom, scheduled for March 26. Email mudroom@avagallery.org to submit a story idea or learn more. AVA’s annual silent auction fundraiser is an event not to be missed, if the streets lined with cars on final bidding night are any indication. This year’s silent auction, featuring works donated by more than 100 artists and craftspeople along with framed vintage posters, opens at 11 a.m. on Saturday, March 21. Preview and early-bird bidding are free and open to the public. The Silent Auction Party and final bids event takes place on Saturday, March 28, from 5:30 to 8 p.m. Proceeds support every aspect of AVA’s art programming and mission. AVA Gallery was named 2014 Business of the Year by the Lebanon Area Chamber of Commerce at their annual holiday special event held on December 10. The following biography was shared at the event and is adapted here with permission. In 1973, a handful of artists from the Upper Valley joined forces to create an art gallery. 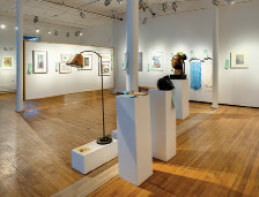 Under the name of the Community Gallery, their first exhibition took place in a barn in Norwich, Vermont. 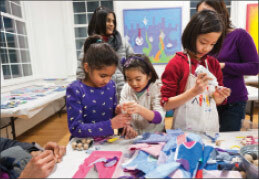 Soon after, the gallery moved to Hanover, obtained nonprofit status, changed its name to AVA (Alliance for Visual Arts) Gallery, and began broadening the scope of its programs to include art classes and community outreach. In 1990, AVA relocated to former H.W. Carter & Sons overall factory at 11 Bank Street in Lebanon. For the next 13 years, the organization rented exhibition spaces and teaching studios in the building to promote and pursue its mission. Simultaneously, the remaining part of the facility filled with artists who rented studios. In 2003, thanks to the generosity of several supporters, AVA acquired the 11 Bank Street building. Shortly thereafter, plans for a necessary and extensive renovation began. Made possible by a $4.5 million capital campaign, the renovation broke round in September 2006. The building re-opened its doors in October 2007. The present-day AVA provides unique experience for people of all ages and abilities. AVA’s stunning exhibition spaces have come an increasingly sought-after venue for artist from all over New England. The 41,500-square-foot building houses four exhibition spaces, seven teaching studios – including two children’s student studios, a stone carving studio, a printmaking studio, and a digital arts media lab – and a resource library, as well as 20 individual artist studios.